One of the most exciting things about custom art framing, is learning about new cultures and history. Recently we had the amazing opportunity to frame a Ketubah for a local Jewish couple. 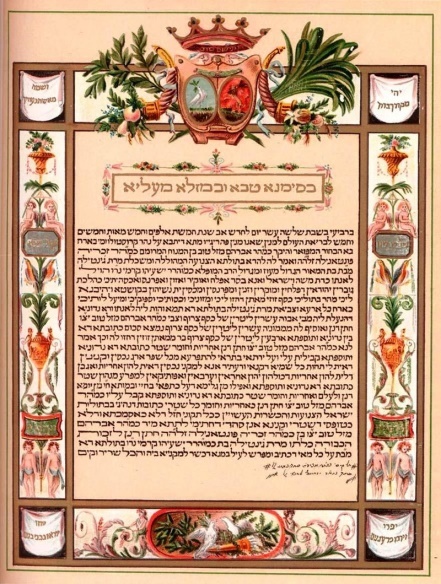 A Ketubah was not something I had ever heard of before, so I was excited to do a little research on it before we started picking out the right frame. 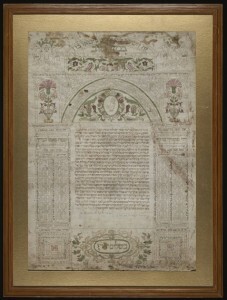 Ketubah, a sacred document in the Jewish religion, means “to write” from the Hebrew root word, Katav. Stated quite simply it means to write out what is expected in the couple’s marriage. This marriage document has been in existence for over 1,000 years! It is a special type of Jewish prenuptial agreement which states the responsibilities of the groom to the bride. They can be written in Aramaic, Hebrew or some couples even choose to have two versions. In addition they can have English added into the Ketubah (the one we had the chance to admire did not have English, it was entirely written in Hebrew!) Many couples also choose to add their vows along with the traditional contract. 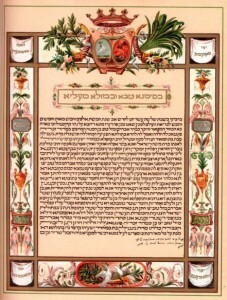 Most places still require a standard marriage license in addition to the Ketubah, but it is seen as an important spiritual document. Oh and you have to love this, the Ketubah follows the Jewish tradition of hiddur mitzvah, which calls for ceremonial objects to be made as beautiful as possible. Got to love all things beautiful, right? The one we did for this couple was no exception to this tradition! Ornate cuts and designs in the document, along with gold leaf, made it a spectacular sight on its own. The gold leaf frame the couple decided to choose was nothing less than gorgeous! It brought out every bit of the gold in their marriage document. Traditionally, couples display these documents in a prominent place in their home as a daily reminder of their commitment to each other. I have no doubt this piece of marriage art is going to look amazing displayed in their home!